Was at Penang yesterday to grab an F42AM for HunnyBunny and ended up with Ndru @ Penang Youth Park after that. We had an arrangement at 5.30 but I reached the place at 5 cause I had to go straight after my purchase. Had a crazy time photographing the skateboarders till my camera cramped on me unable to detect my beercan. Managed to rectify it and continued shooting. Later me and Ndru sat down and we discussed about the 50MM as well as the 28MM Minoltas. Ndru also tested out my SAL50F14. Here are some of the shots taken with the exception of two I've kept for my Project 365. All pictures out of camera direct and changed to Black and white @ Lightroom. Watermark and borders @ Creative Suite 4. During the night, we had an SCM gathering @ Apex Coffee, Bay Avenue. Pictures and more stories tomorrow k? p/s: Will be meeting Alvin later for a well due coffee session. :) BTW, left my handset with crazy Edz. Arrrgh, the agony of not having a HP on hand is just... excruciating. Shades are good. But they'll only cover so much for so short. Many people go for Oakley. I go for Aviator types. What's your type? 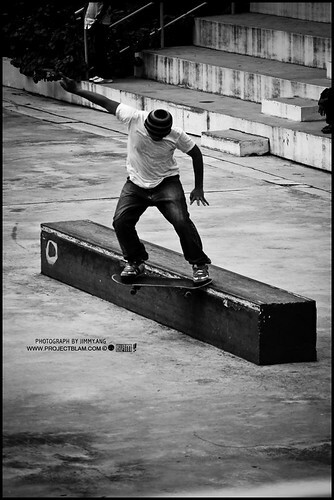 ok one thing for sure, the skateboarders dont look as skillful as the photos potray. LOL. they're better than me... but just not good enough for the WOW factor. All normal stunts.